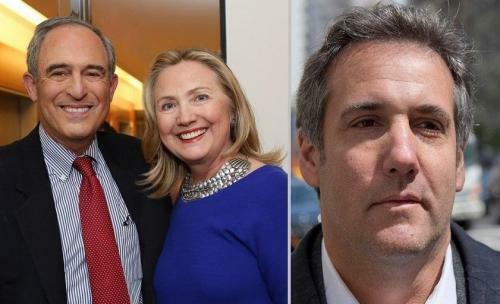 Lanny Davis – the attorney for Michael Cohen, has massively backpedaled on “confident assertions” that Cohen would share information with investigators that President Trump knew of Russian efforts to undermine Democratic nominee Hillary Clinton – a lifelong friend of Davis’. The day after CNN’s report, the Washington Post – using an “anonymous source” they now admit was Davis, peddled the same story that “Cohen had told associates that he witnessed an exchange in which Trump Jr. told his father about an upcoming gathering in which he expected to get information about Clinton,” however the Post didn’t say Trump Jr. told Sr. it was the Russians. “I believe that Mr. Cohen has direct knowledge that would be of interest to Mr. Mueller that suggests — I’m not sure it proves — that Mr. Trump was aware of Russian government agents hacking illegally, committing computer crimes, to the detriment of the candidate who he was running against, Hillary Clinton,” Davis said in a Wednesday interview with PBS NewsHour. We wonder how many people donated to Cohen’s “GoFundMe” campaign assuming he had the goods? We wonder if Podesta ever let Davis crisis manage Hillary Clinton’s email scandal?